The 36 under 36 list recipients will be highlighted at YLD's "WYLD on Mag Mile" party on Aug. 15 on the Howells & Hood patio. 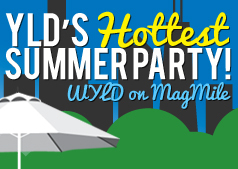 Enjoy a night outside at YLD's hottest summer party! Laurel Grauer is a Jew of action. If there's any kind of need in the community, she will see it. Then she finds a way to fill it by connecting people with organizations or programs that can help. "When Laurie hasn't been able to find resources to help individuals or groups, she worked to create new programs and organizations that would fill the need," said Jennifer Sims, a friend who nominated Laurel. "While experiencing unemployment herself, she realized there was a need in the community to support those who were under or unemployed … She partnered with Jewish Vocational Services and Congregation Emanuel to create a monthly support group for the unemployed." Two years ago, Laurel recognized the need for a support network for young Jewish Gay, Lesbian, Bisexual, Transgender and Queer professionals. She co-founded and is a board member for Gesher Chicago. The group serves as a network for the Chicago Jewish GLBTQ community by organizing Shabbat potlucks and other social events, and is a resource for members and their allies. Laurel is currently the membership director and past social action director for Or Chadash. She has taught religious education at Temple Sholom for six years. She has worked with Equality Illinois to help form the Interfaith Coalition for Civil Unions, a group of 15 religious organizations from across the state that successfully lobbied state leaders to pass Civil Union legislation. How do you Jew in Chicago? I’m a board member of Congregation Or Chadash. I teach at Temple Sholom of Chicago. I’m a member and co-founder of Gesher Chicago. I volunteer with the JCUA and Kehilla – and I talk with my hands. I’m passionate about understanding people’s needs and connecting them to the right resources. I’m also passionate about combating economic disparities, advocating for civil rights and purchasing locally grown produce. On the lighter side, I’m obsessed with craft beers and, begrudgingly – my iPad. Connecting people to appropriate resources is one of my greatest passions…Recognizing that people of faith needed to speak out on behalf of GLBT legislation, I worked with Equality Illinois, progressive congregations and local activists to form the Interfaith Coalition for Civil Unions. Thankfully, I have also been able to give back through positions I have held within my congregation. I have worked to bring groups such as JVS, Kehillah, Mitziut and Congregation Emanuel together with Or Chadash to co-sponsor events in order to create connections between the group’s members. As a religious studies teacher, I strive to instill values of diversity and social justice in my students by discussing Jewish values and societal contributions of Jewish heroes. create a comprehensive resource network that would assist people in need. As a caseworker, I discovered that Chicago has many resources for underserved populations, but not all of these programs were accessible or even known to those who were in need of them. Additionally, I would invest in programming that would create a more cohesive and vibrant GLBTQ Jewish community. In 10 years, young Jewish adults will become more involved in social ventures that will close the economic gaps that exist in today’s society. As they become more informed consumers, they will purchase products that will infuse the local economy and expand ethical production efforts. I am hopeful that in 10 years, the students I teach today will remain connected to their Jewish roots as well as contribute to their cultural heritage. Lastly, I look forward to seeing an expansion of Jewish programs and resources that speak specifically to GLBT Jews and advocate for further inclusion. I expect to continue advocating for fair economic opportunities and civil liberties. I plan to be an active Jewish mother who will work with her partner to raise their children to be infused with a passion for Judaism, learning, helping others and questioning authority (other than my own.) As always, I will do whatever I can to strengthen the Chicago Jewish community. In short, in 10 years…sleep will be a luxury for me.